Like fluffy, cheesy clouds with crispy toasted cheese bottoms, these savory white cheddar cheese puffs make a perfect party appetizer! They’re easier to prepare than you might think, and freeze beautifully for a perfect make-ahead party snack. 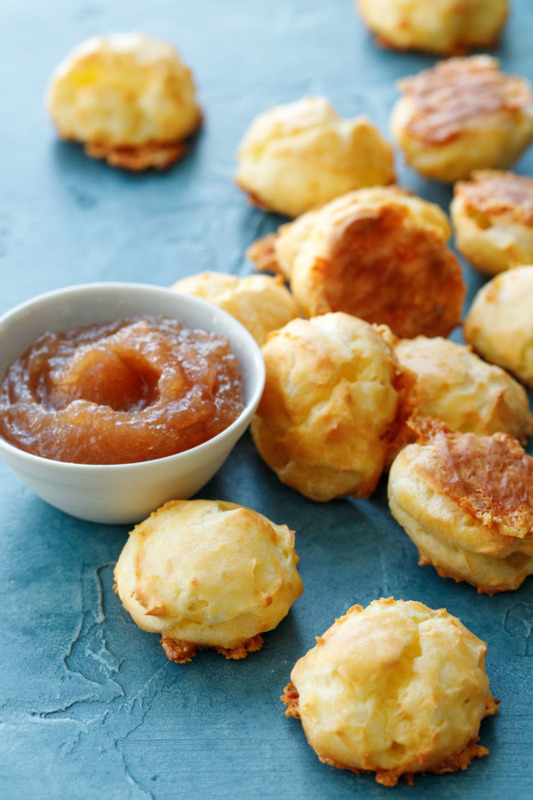 These cheesy little puffs will perk up any party! Serve piled on a platter with bowls of homemade apple butter or tomato peach jam for a sweet and savory combination you’ll simply adore. When it comes to party appetizers, cheese is king. But instead of setting out a boring old cheese plate, why not make something a little more… unique? These white cheddar gougères (if I ever spell that right on the first try, accent and all, it will be a miracle) are like a savory little puff of pastry heaven. While cheese puffs are traditionally made with Gruyère, Comté or Emmentaler cheese (more accents, oh dear), we opted instead for the accent-less but no less delicious sharp white cheddar. Just be careful, these puffs are so light and airy and flavorful you might find you’ve just devoured half a dozen of them without a second thought. 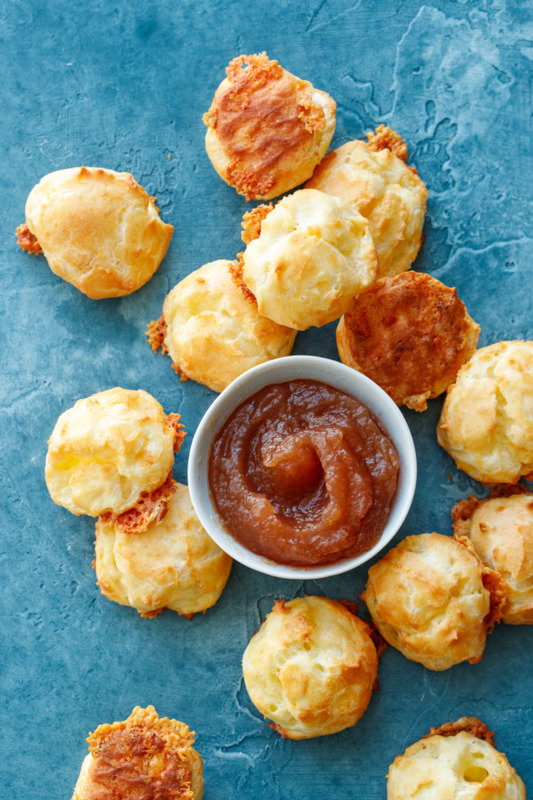 Cheese puffs are lovely served with a lightly spiced apple butter (for the same reason that cheddar crusts for apple pies are so popular, the flavor combination is simply smashing). If you wanted to go a more savory route you could serve them with a bowl of homemade marinara sauce or even something like a sour cream dip. I mean, when it comes to dip options, why stop at one? 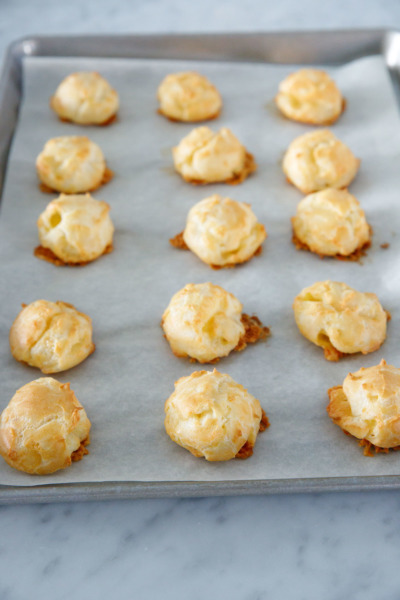 To make homemade gougères, start with a basic choux pastry, which relies on steam for lift (same sort of dough, albeit a savory version, as you’d make for éclairs or cream puffs). 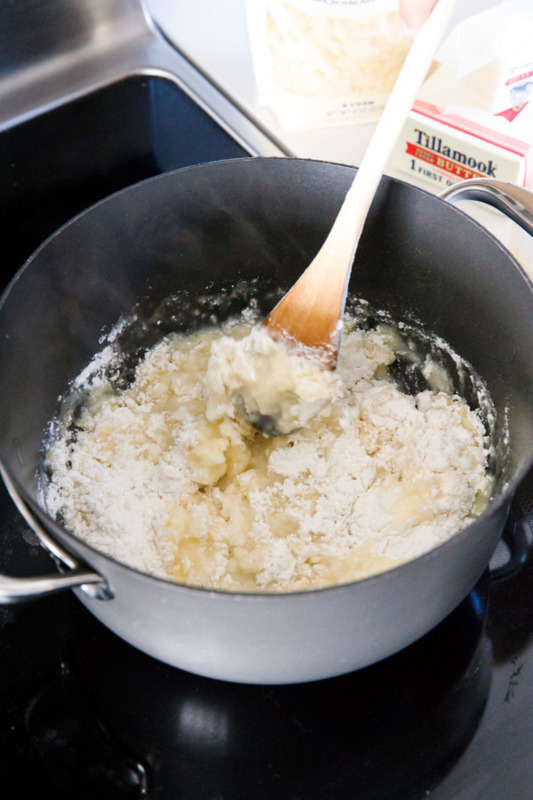 Once you add the flour, stir until the dough starts to pull away from the sides of the pan into a ball. Then, off the heat, add the eggs, one at a time. When you add the egg at first the dough will sort of flop around like a wet fish, but keep in stirring vigorously (yes, you’ll get an arm workout for sure!) until it smooths out. Then add the next egg and do it all over again. If you prefer you can transfer the dough into the bowl of a stand mixer and use that to help you beat in the eggs (and if you are doubling the batch I definitely recommend doing so lest your arm fall off or something). The shredded cheese is stirred in at the very end. You can certainly pipe the dough if you prefer, although I found the cheese made it a bit hard to do so. Scooping the dough using a small cookie scoop was immensely easier, although the final puffs are definitely more rustic looking. We made our gougères using Tillamook’s Farmstyle-Cut Shredded Sharp White Cheddar (full disclosure, we originally created this recipe for Tillamook as part of our ongoing Instagram partnership, but wanted to share it here with you too!) The coarse shreds settle to the bottom of the puff as it bakes, forming a lovely toasted cheese crust on the bottom (think croque monsieur). I love Tillamook’s shreds for recipes like this since they aren’t coated with anti-caking agents and stabilizers like other brands; such additives prevent the cheese from melting as smoothly. If you use more finely shredded cheese it’ll stay suspended within the puff itself, making for a cheesier pastry and a less crispy bottom. Either way you win, I’d say. 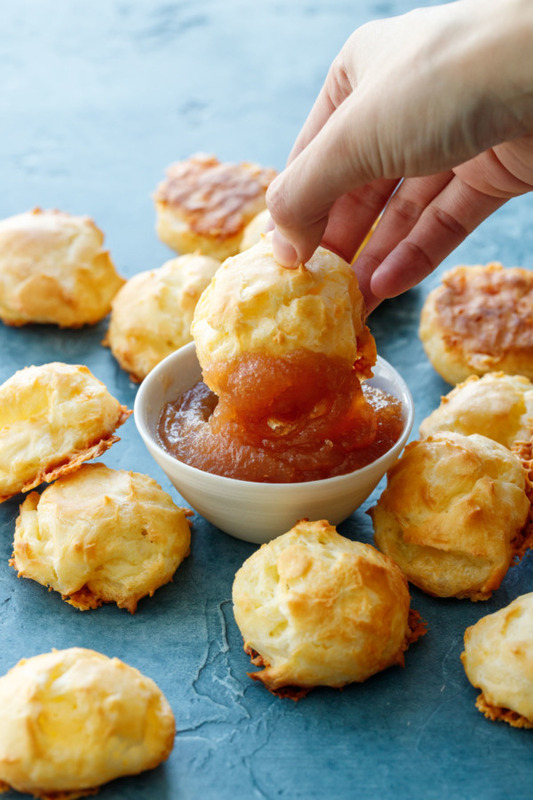 Like fluffy, cheesy clouds, these savory cheese puffs make a perfect party appetizer! 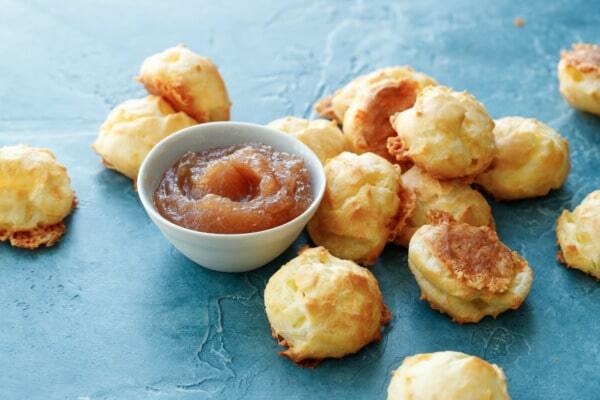 Serve with apple butter for a sweet and savory combination you’ll simply adore! 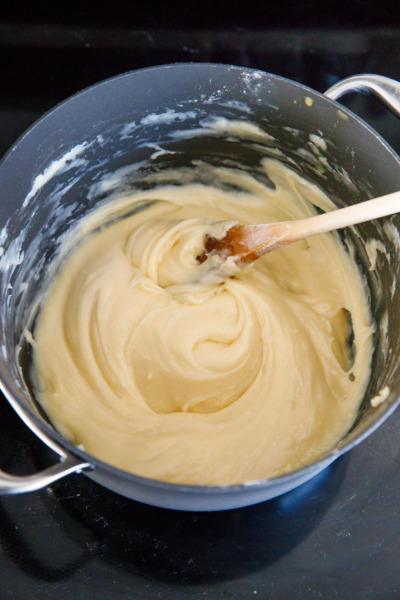 Combine butter, water and salt in a medium saucepan set over medium heat. Bring to a boil. 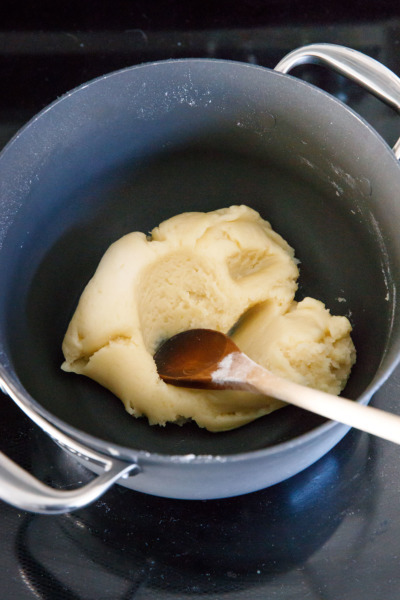 Remove from heat and add flour, stirring until it comes together in a smooth dough. Return to heat and continue to stir until the dough dries out slightly and starts to pull away from the pan, about 2 minutes more. 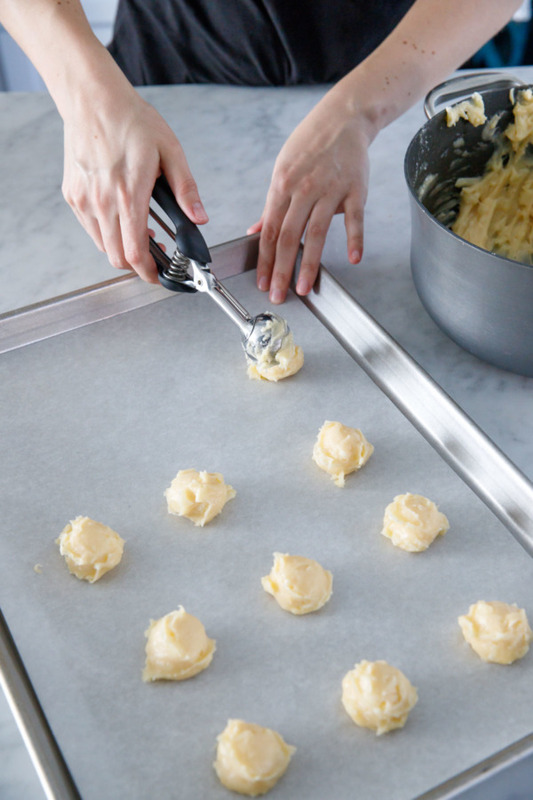 Using a small cookie scoop, spoon 1-inch balls of dough onto baking sheets, leaving an inch or two of space between them. You can also transfer the dough to a piping bag fitted with a large round tip and pipe the dough that way instead. 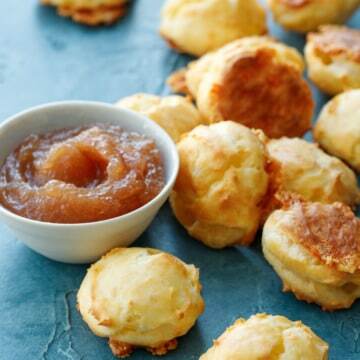 Bake for 28 to 30 minutes or until gougères are puffed and bottoms are golden brown. Serve warm with apple butter. 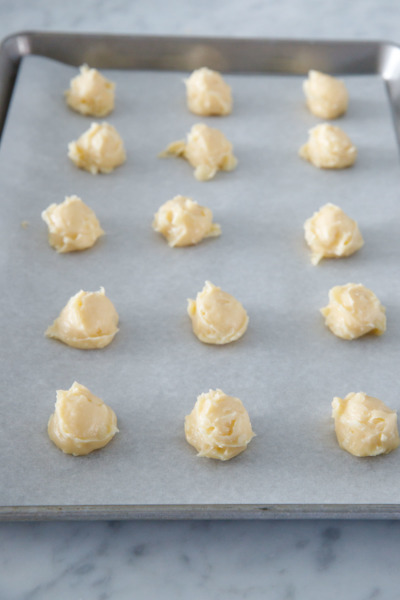 Gougères can also be made ahead of time and refrigerated in an airtight container or even frozen in a zip-top bag; reheat in a 350 degree oven until hot.